Welcome To Your Senses: Guntrol Yourself guys ! Tamil Heroes think too much of themselves.. Chumma, every movie they pick up a weapon and give a nice still, as if they have a secret affair with the weapon. Aruvaa is another theme. I mean, look at Vijayakanth. What the hell is he doing with the gun on his forehead ? Thinking about "The enemy is in my mind.. Im going to kill him" ? Im not too impressed, when some movie comes with a grand promo, with the hero doing some macho stuffs.. Just that its going to be damn funny. Im waiting to watch Perarasu. I want to know what Vijayakanth does with the gun. BTW, You are welcome to give any caption to the Collage. 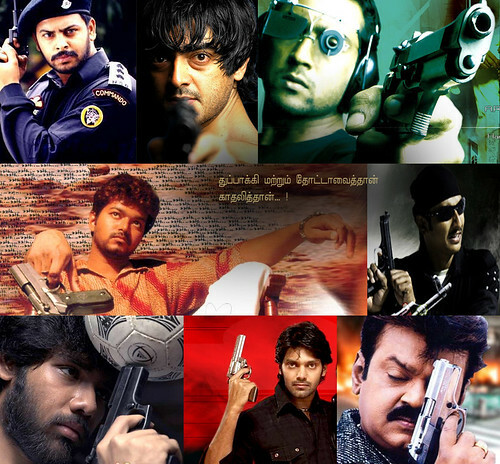 I couldnt get the Aadhi still with Vijay pointing two guns in two different directions riing a bike. If someone has it, mail it to me. karthik,, Idhathaan naanum solla vandhen. thalaivaru thuppaki ya thoottale athu style..
Kuruthippunal and VV stills paartha, Gun advertisement madhiri semma prova irukkum..
Cant mingle thalai with these guys. Im waiting to watch Perarasu. Its a mind-set problem i guess.... We accept all such non-sense with Hollywood heros ??? why not ours --- Indian heros ? ?